At this year’s Innotribe at Sibos (25-29 Oct 2010), we have a whole track on “Smart Data” aka “Semantic Web”. We decided to call it Smart Data is – at least in our industry – the words “semantic web” have ironically little meaning. I am a big believer of Semantic Web, and always on the look for good education material to help me explain what it is and why it is important. Here is a video made by Cisco, by their IBSG group (Internet Business Solutions Group). I had the pleasure of recently working with IBSG folks, and I can tell you these guys are NOT the router guys. They are very knowledgeable. I also recently discovered they had a whole practice on digital federated identity and now this one on semantic web. Starting (!) from the iPhone App Siri (Siri was acquired by Apple in April 2010), to WiseWindow, the video gives you some teasers on what this technology can do for you, and then moves into a really good and quick tutorial on the standards underpinning semantic web. The Siri application is about understanding natural language and giving intentional feedback and information back to the user. Watch the detailed video above. The speaker also emphasizes the importance of onthologies. Highly relevant in a SWIFT Standards context. With the ISO20022 Standards, SWIFT is already at the core of THE semantic onthology for the financial industry. Fore Semantic web, an untapped goldmine for the emerging future of SWIFT. The ability to understand natural language and reason about data could improve business intelligence for financial services. In essence, today SWIFT already tags semantically the fields of the standard SWIFT messages. Tomorrow – with our onthology – we could tag ANY information, including non-structured information hidden in PDF’s or Word documents, overlay that information with existing other structured data sources, and offer pattern recognition services leading to deeper intelligence about our and our customers’ data. What I want to make clear is that this is not only related to the social web. On the contrary. It’s about data-integration within and across organizations. Was that not the purpose of EAI (Enterprise Application Integration) and EDI (Electronic Data Interchange) ? The difference is that the above systems are often messaging based: sending (standardized) structured messages from one system to another. into centralized or distributed data repositories. The key challenge in all this is to be able to (automatically) tag data semantically. Who else than SWIFT would be better placed to be that semantic quality anchor for the financial industry ? I have seen recently from Cisco how they do live-streaming-and-tagging of video for their internal portal. Maybe we should invite somebody from the Cisco IBSG-team to our Smart Data stream at Sibos ? BTW: Guido Jouret from Cisco will speak at Innotribe at Sibos in the Open Innovation Best Practices session on Thursday 28 Oct 2010. Guido Jouret is Chief Technology Officer (CTO) of Cisco’s Emerging Markets Technology Group (EMTG), which is responsible for incubating Cisco’s future billion-dollar businesses. What choices will you make today ? If you have the time, please watch this presentation" How not to be seen” by futurist Mark Pesce. I mentioned it already yesterday in my post “The DJ with the Brainwave Helmet”, but now I took the time to watch the +/- 1 hour presentation. It profoundly explains what’s going on in our ever more connected world. No need to further quote, as the full transcript is here. This guy is super-smart. Follow him on twitter and on his blogs. Social Graph is also about Sibos 2009 winning project “eMe”, but then on steroids. Completely revised. Definitely in the vision of Mark Pesce. With privacy and user control seen in a distributed internet world. NOT one single digital vault, or even several digital vaults. Whether they are “owned” and “controlled” by Governments, Banks, FaceBooks, Googles and alike. Completely revising the “business model”. Where the value flows to the users, the owners of their social graph. Not to banks. Not to governments. Not to some controlling party in the middle. The is no “where”, no “middle” on the internet. That’s where we got eMe wrong. No, we have to revisit the whole concept of eMe along the open Plexus lines that Marc Pesce is describing in his “How not to be seen” presentation. I will talk to Peter Hinssen, when he’s back from down under. So that we have something to say about eMe at Innotribe at Sibos 2010 in Amsterdam. Oh, and if you like this sort of stuff, here is another presentation “Dense and Thick” by Mark Pesce at Webstock2010. As a matter of fact, this presentation is even better, as Mark does a fabulous job in giving us a perspective of the current state of the web, how we got here and where this might lead us. Not just by throwing boring statistical data at us, but with deep insights and with a speaker’s passion that is difficult to match. Without really mentioning (ok, only once), Mark Pesce is describing a vision of the semantic web that is not push-oriented like Tim Berners Lee, but truly “pulling” us – human beings – in this super-exciting world where meaning becomes explicit and exploitable and can be manipulated (hopefully in the positive sense of the word). It may be hard to believe, but we’re only just at the very beginnings of the web revolution. In the first fifteen years (1994-2009), the human world of culture and civilization was sucked into the black hole of cyberspace. Now the real world is poised to follow. Augmented Reality (AR) shows that when we peer through a portal, and look upon the world, it’s almost embarrassingly empty of our annotations. That data is there – the world is the database of itself – but it can’t be brought immediately to hand with a search or a gesture. That’s the next place we will go: we will build a virtual body for the real world, a dense database of everything, both natural and artificial. In fifteen years’ time, we’ll wonder how we got along without it. This means that the clock has been reset. Everything we thought we knew about how the Web works, what the Web does for us, and who controls the Web is up for grabs, once again. We will see bright shining stars – and sudden, brief supernovas – just as we did in the Web’s early years. The opportunities are breathtaking, the innovations will be flying fast and thick. All of this is now within our grasp. This guy is a real discovery for me, and hopefully to you as well. I will ping Mark to check whether he is interested in the eMe update and hopefully lively ensuing debate at Innotribe at Sibos2010 in October. Might be a challenge, as his intellect humbles me deeply, and maybe he is just not interested in such a mundane conference. Found this TED 2010 video via Kurt Vega’s tweets. Out-of-the-box support for facial expressions and emotional experiences, with some sensitivity adjustments available for personalization. The demo is focusing on the “cognitive suite”: the ability to move virtual objects with your mind. Start mixing this with the ongoing discussions on personal digital identity. As you will notice, the demo starts with making a personal profile for this headset owner. And tuning to a neutral signal, a signal where you’re doing nothing particular, your are relaxed, hanging-out: a but like my holidays at home where I basically don’t do anything particular other than hanging around. The cool stuff starts when the helmet man starts visualizing something that does not exist in real life: making something disappear. Applications are obvious in virtual reality games, domotica systems, all sort of gesture and thought based interactions, control an electric wheel-chair. In banking it would be nice is I could raise the balance on my account just by thinking about it. Sometimes, I think of myself as a disc-jockey (which I was as a matter of fact for more than 15 years starting in the late 70’ies), and I very much like Ethan Zuckerberg’s description of a DJ in this also great TED 2010 video on our distorted world-views. getting you out of your normal orbit, of stepping out of your usual “flock” of people you normally interact with (both on- and off-line). Of course, I could now make jokes on Faithless “God is a DJ”, and/or refer to one of my previous posts called “We are as gods and might as well get good at it”, but I won’t do that. Instead, I’d like to share with you the feeling of giving pleasure to my audience. It’s something I feel while writing these blogs, and it’s a very similar feeling as being a DJ in front of an audience and pushing people forward. As a DJ, I was doing some quite big gigs for 3,000 people or so, and my following community is not that big yet. But the feeling is the same, and everyday there are some more folks following my tweets. Some more reacting to my blog. Some more getting inspired by what’s on these pages. So, I just continue doing that, and hope to inspire you to dream and execute your dreams. Last week, Kosta kicked-off the next Innotribe @ Sibos2010. I am pleased and excited to complement Kosta’s introduction by sharing with you our high-level program for the Sibos week (25-29 October 2010). and a still to be announced very senior banker on tectonic shifts in banking. Both in content, quality of the speakers, and format of this session, this will be THE not-to-be-missed session on Sibos Monday. We are convinced it will set the bar for any session for the upcoming week. Cloud: following last year’s Labs, which were focused on the economics of cloud computing, this year focuses on the practical implementation, user experiences, and why it’s important for the financial industry. There will be a specific focus on hybrid cloud models and API’s. Mobile: the emergence of mobile payments, especially in the worker’s remittances area, and the role of banks. Smart data: how to capitalise on the power of semantic web technologies to enable greater intelligence for financial institutions. The Long Now: this series of interactive workshops will engage in long term scenario planning for the financial industry. The line-up of speakers, face-to-face panel members and moderators is stronger than ever before. This will be the subject of subsequent Innotribe @ Sibos2010 blogs. In addition, we will have 2 Masterclasses Innovation, we have invited the 5 leading software vendors for innovation management tools, and we’ll have an update on eMe (winner of last year). We also teamed-up in a quite significant way with our colleagues from Standards and Technology. You will notice on the Sibos program a number of interactive sessions that have been co-designed with Innotribe. The exciting grand finale: the best of the Innotribe week comes together on Thursday 28 October 2010. We start with “Pitch your Innotribe Lab”, a competition between the best idea teams that were formed during the Labs throughout the week, in front of the buyer’s panel. 5 minutes pitches with Q&A by the SWIFT Buyer’s Panel, with input from our VC-Advisors. They compete for the Sibos2010 Innovation Award. Last year’s winner was eMe. Who will it be this year ? To pump up your adrenaline levels, we’ll close with a real Start-Up Competition, where we have invited some of the start-ups and great idea teams we met throughout the year. They will pitch in front of a real VC-Panel. And who knows: last year’s Innotribe made it to the final plenary closing of Sibos. We know this year’s Innotribe @ Sibos is even better and The Long Now seems to be positioned in pole-position. All the Innotribe @ Sibos2010 sessions will be supported and facilitated by a team from The Value Web. The Interactive Workspace: a special built space in the middle of the exhibition centre that will host all the other Innotribe sessions; the design of that space is just awesome. The special Innotribe corner on the SWIFT Stand that will host the R&D sessions, including the results of some SWIFT proof-of-concepts. Time for hanging around, some biking, some good food, and… a good book. If you want to follow what I am reading, check-out my page on Goodreads. that is a pleasant read, that has depth. “You are not a gadget” by Jaron Larnier is such a book. I discovered it thanks to a tweet of my friend Paul, who reacted to one of my enthusiastic Singularity tweets. The title of this blog post “You have to be somebody before you can share yourself” is very early in the book, and captures its essence. 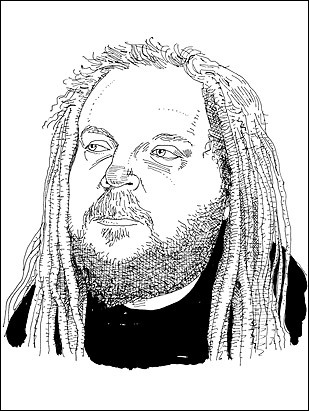 Jaron Larnier was listed on The 2010 TIME 100 in the Thinkers category. His Wikipedia entry is here. It’s a great read if you are in your over-enthusiasm mode about computationalism, the noosphere, the Singularity, web 2.0, the long tail, the hive mind, the global brain, crowdsourcing, collective intelligence and all the other buzzwords and trends and all the rest. It gives you some solid pushback and sound criticism. How technology is limiting our potential and who we are on-line. This of course resonated a lot with my work on Digital Identity. Our communication limitations. He has a great chapter on how cephalopods have the great ability to “morph” and how one could use “visual” communication and another dimension of communication, other than language. And how humans in virtual reality environments quickly adapt to a body with tentacles. Intriguing ! The notion of “neoteny”: humans are born as fetuses in air, and our brain is being developed during childhood. Lanier compares this to a newborn horse that can stand on its own and already possesses almost all the skills of an adult horse. Humans – in modern civilizations – have an artificial, protected space called “the classroom, the extended womb”. Neoteny opens a window to the world before our brains can be developed under the sole influence of instinct. A similar concept related to neoteny – “generativity” – comes back in another great read Firms of Endearment: How World-class Companies Profit from Passion and Purpose. It’s about the epochal change into the Age of Transcendence. The dictionary defines transcendence as a "state of excelling or surpassing or going beyond usual limits." The Firms of Endearment book in essence talks about a new form of capitalism that is not only focused on profit and shareholders’ value, but on value creation for all parties in a company’s stakeholders’ ecosystem. What a great potential for my employer SWIFT ! We are indeed a full-blown cooperative international organization with our roots in financial services. In essence, Jaron Laniers’ manifesto and rant is about “The deep meaning of personhood is being reduced by illusions of bits”. That should make us reflect deeply on how we want to engage as human beings in an on-line world, how we define digital identity in the relative and the absolute, and be very vigilant that we don’t loose our potential in our technology enthusiasm. If you are young and childless, you can run around in a van to gigs, and you can promote those gigs online. You will make barely any money, but you can crash on couches and dine with fans you meet through the web. This is a good era for that kind of musical adventure. If I were in my twenties I would be doing it. But it is a youthiness career. Very few people can raise kids with that lifestyle. It’s treacherous in the long run, as youth fades. My blog is my “adult” way of doing gigs online. It is difficult to assess how much of this is a word-by-word script, or how much real interaction is going on here. It gives a sense where we are heading. Imagine this on your iPAD. My conservative guess is this will be real within the next 5 years. This is very similar to what Oblong is doing with gesture based interfaces. See my previous blog on Oblong here. John Underkoffler indeed also said 5 years before this hits any PC. Oh yes, in case I forget, Oblong will be at Innotribe at Sibos 2010 in the Smart Data track.